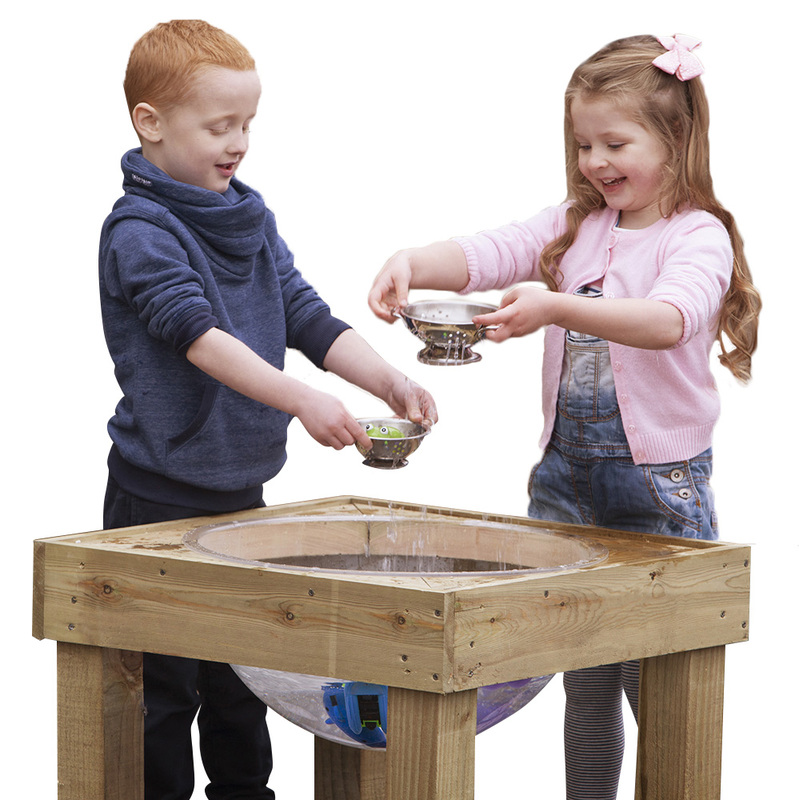 Wooden freestanding water play unit, ideal for outdoor use in nurseries, pre-schools and reception classrooms. This standing-height water play unit is manufactured from tanalised pine timber with a natural finish and comes with a non-removable plastic bowl. The polycarbonate plastic bowl makes the unit versatile and perfect for use with water, sand, soil, leaves and many more. Water play encourages sensory development and gives an opportunity for children to explore the attributes a liquid has and the way water behaves when it is splashed and poured. The high-quality wooden frame of this play unit makes it durable, sturdy and boasts plenty of room for exploration of different materials in outdoor group play. The height of the unit is suitable for children aged 5+ and is an ideal resource for encouraging exploratory water play. Complete with a robust wooden lid, the unit can easily be stored away. The wooden lid also transforms the unit into a perfect outdoor work surface when taking lessons outside. Water play is a perfect activity for introducing mathematical and scientific theories to early years in a fun and child-friendly way. Provide children with different objects so they are able to see which objects float, which sink and develop an understanding of density and weight of everyday objects. Water helps to build social skills amongst early years. When playing together, children build communication skills as well as learning to share and compromise with peers. Use the unit for sand play with children to help aid their co-ordination skills by building hand and arm muscles. This outdoor water play unit comes fully assembled and easy clean surfaces reduce mess during water play. If you require any further information on the Outdoor Wooden Water Play Table please contact us or call us on 01733 511121.